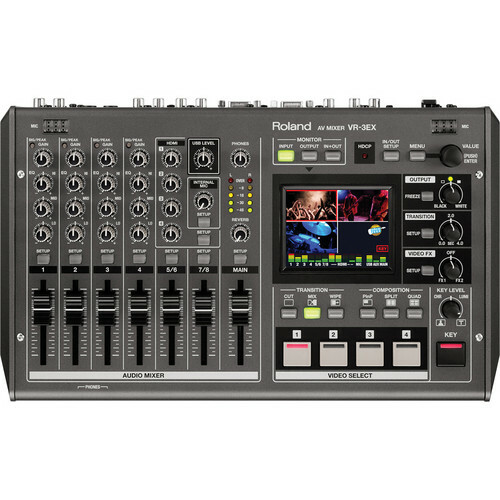 Roland VR-3EX A/V Mixer DJParts - All Variety of Parts that DJ Needs. The Roland VR-3EX is the next generation 4-channel SD performance mixer which features HDMI inputs/outputs, USB streaming, HDCP support, built-in touch multi-viewer, an audio mixer all in a compact portable unit. Designed to be a live production switcher thebuilt-in audio mixer with up to 4 frames delay to “lipsync” your video source. Scaling on the output allows you to output up to 1080p HD Video and Audio quality. See the current VR-3EX Streaming Software Compatibility list for more information on streaming software compatibility.